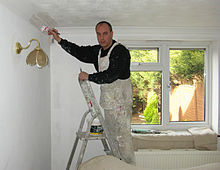 A house painter and decorator is a tradesman responsible for the painting and decorating of buildings, and is also known as a decorator or house painter. The purpose of painting is to improve the appearance of a building and to protect it from damage by water, corrosion, insects and mold. Wikimedia Commons has media related to Painters (artisans).